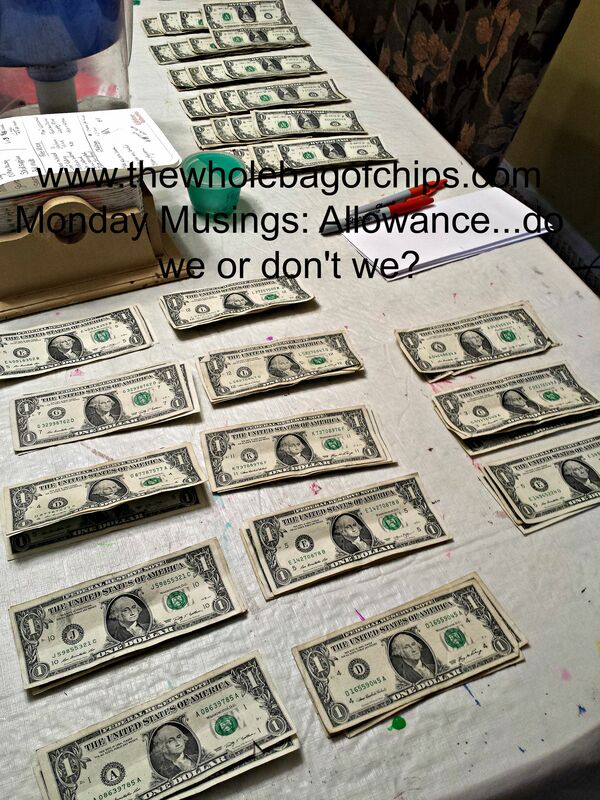 Monday Musings: Allowance…do we or don’t we? Do your kids earn an allowance? I’m sure that’s a question every parent asks themselves at some point during their parenting journey. I also know for sure that there are many schools of thought on the issue. Some people believe that a family works together as a team, and no one person on the team gets paid for pitching in to get the household jobs done. Other people believe that hard work earns rewards, whether it’s house work, yard work or school work. Yet other people don’t believe their kids should have chores at all, that their school work is work enough, and their focus should be on that and that alone. It’s all good, I’m sure, and whatever works for one family may not work for another. As parents, we too asked ourselves those same questions as our kids were young. We definitely knew we didn’t pay them for grades on their report cards or school work. When our kids were very small, they didn’t do much in the way of chores, but as they grew older, they were more capable of helping out around the house and cleaning up after themselves. We began to question the idea of allowance in order to encourage them to consistently get certain jobs around the house done. Early on, we went with the philosophy that we were all a team and pitched in together and everything just gets done. We mostly subscribed to that philosophy because we were not financially in a position to pay anyone anything extra, and when you have a large family, you don’t want to institute something you can’t afford. Three kids times four or five weeks of allowance a month adds up quickly and there wasn’t enough to spare, for quite a few years in a row. But as our financial situation changed over time, so did our philosophy. We had some money to spare and our kids were all big enough to manage household chores. More importantly, we had always stayed true to the “We buy you what you need, you need to save your money for the things you want,” philosophy. It was tough though, because our kids were willing to save their money, they just had no way to earn it. A once-a-year birthday gift might garner them $25 or $50 from a family member or two, but other than that, they wanted to save for things that were “wants” and yet they had no flow of income. They were too young to go out and get a real job. We also felt strongly that a large part of life lessons and experiences revolve around saving money, setting goals, having money, not having money because you spent it on something previously that you now wish you hadn’t, or better yet, the sense of pride of having set a goal, saved for a period of time, sacrificed not purchasing smaller items, and then walking away with a big-ticket item you bought yourself. Without a flow of income, our kids couldn’t learn any of those types of life lessons. And so, a couple of years back, we instituted a set of weekly chores and each month I’d cash my paycheck, dole out the next month’s worth of allowance and place it in four weekly piles in an envelope. At the end of the week, if the kids had done their chores they could take their allowance. If they hadn’t, it stayed in the envelope. It was a little bit hard to track though. I couldn’t easily keep track of who had done what, who hadn’t done what, and it was hard to “dock their pay” for not doing jobs. Yet, some kids went over and above helping out with extra-big jobs, and I had no way to compensate them when I really wanted to, just as I would an employee that worked overtime. I also had extra jobs I’d love to see them take the initiative on, but I knew that wouldn’t just happen on their own. Additionally, on many occasions, I’d see a random $5.00-one week’s pay for one child- still sitting in the envelope when I opened it to fill it the next month, and yet no one knew whose it was or who didn’t remember to take their allowance during the month prior. I’d put it back in the envelope for the next month, but I always felt badly that someone lost out on their weekly allowance. I can’t take credit for this, as it was passed along to me and the rest of the Facebook nation this past summer. This past summer, I saw an allowance idea pass me by on Facebook, and it stopped me in my tracks. I have posted it here on the left, and if it’s yours, please feel free to credit yourself in the comments. When I got it and saved it, I had no idea where it had originated. I shared it as well, and my husband saw it and commented on it. We loved the idea of taking the money and splitting it up by jobs, and I loved some of the jobs I saw on there. The photo got my wheels turning, as I began to think of how I could change our own allowance system in order to make it more efficient and more exciting. It was summertime, my downtime, and if I was going to start a new system, now was the time to do it. I knew I needed something that was easy to manage, something that would allow me to see who had done what and when, and who had taken their money and who hadn’t, and I also needed a way to encourage some extra work, as well as a way to reward those who go over and above when helping out. Additionally, I wanted to throw a couple of things in there that would help to remind the kids of things one of them might struggle with on a daily basis. They’re all too old for a sticker chart, but no one is ever too old to earn a dollar if they remember to do a particular thing before school in the morning or before bed at night, and it is worth more than a dollar to me if it makes the morning rush less of a rush. As I drove around town in August, my idea began to formulate in my head. I knew I could very easily go to the local Lakeshore Learning Store and get library book pockets, the kind that used to be inside of library books to house the library card you’d sign your books out with. I also knew I could get a pack of alphabet letters. I had a nice, empty linen closet door right outside their bedrooms, right next to the main bathroom in our house, which is essentially theirs, and solely their job to clean each week. I began to think of my marketing and advertising hooks. I came up with the idea of “Help Wanted” as a title and I liked it a lot. I stopped at Laksehore one day and I was thrilled to see so many colorful options for alphabets and library card pockets. I love pretty things, and nothing helps to motivate kids more than a bright, colorful space (filled with money). I picked out a set of each and a set of adhesive squares to cut up for adhering my letters to the door without taking off any paint. The pockets were self-adhesive. I had some white labels at home that I could use to label the pockets. At the dollar store I grabbed a set of several hundred colored paperclips and I was happy to see that each of my kids’ favorite colors were represented in the pack. Ultra-convenient. Just before I cashed my August paycheck, I set up our new allowance system, piquing everyone’s interest here at home. One August day, just before school started, and just before I cashed my check, I began to set up my door. The kids helped me punch out letters, but they had no idea what they would be spelling out, at first. I put my “Help Wanted” sign at the top and started by putting my six pockets there for the kids’ weekly chores. Those pockets would be filled (and hopefully emptied) once per week. They were instantly excited. Then, I added a new section. 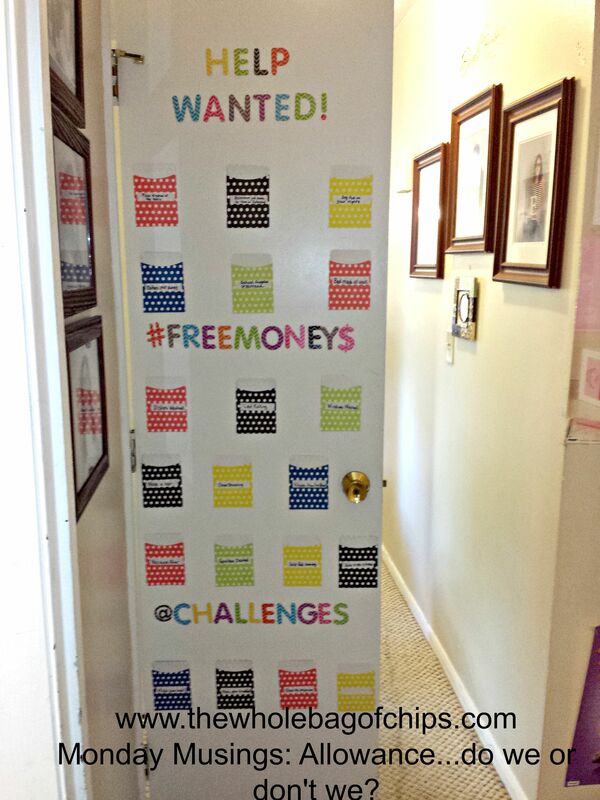 The alphabet set had an “#” sign, so I thought that was incredibly cute and I used it for my next section: “#Freemoney$” which I hoped would encourage some extra jobs to be done and would let the kids work extra hard if they were saving for something big. I included things that were only seasonal, things I knew wouldn’t take place every week, but I also included things I knew they could truly do at least one time each month. These pockets were filled once to start, but would only be re-filled once they were emptied. The snow shoveling job won’t be done for a long, long time, but yet the leaf raking job might get done next month. The kids were really on board now, and the pockets weren’t even filled with money yet, nor would they be for another whole week until I got paid myself. This would let them really get pumped up before the money went in, and then they’d have another week until they could take money out; they’d have to complete their weekly jobs first. 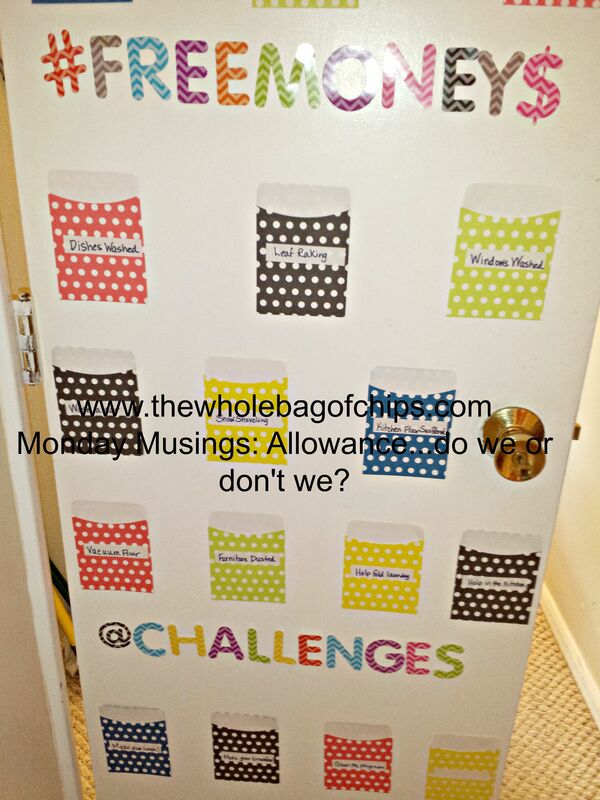 Looking at my door display however, they saw jobs that weren’t there that they thought I could add on as challenges. There was an “@” sign in the alphabet pack too, so we set up an “@Challenges” section and added in those jobs too. 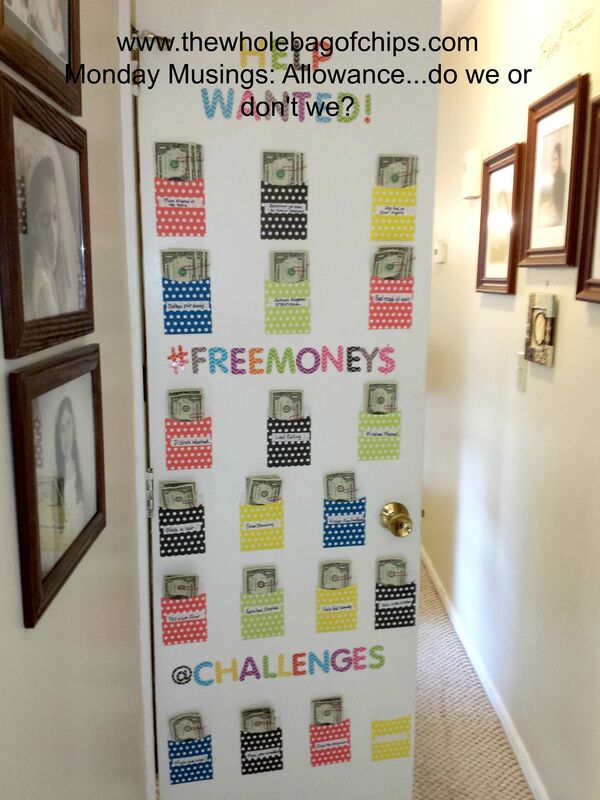 To me, they were similar to the Free money jobs, but I wanted the kids to be invested and involved so I let them create this extra section themselves. I had to admit, I was in love with my allowance system display and I couldn’t wait to see if it worked or not. The kids thought for sure that they were about to be rich. The following week, I cashed my check, counted out $3 per pocket-one dollar per child per pocket- and figured out how much extra I needed to refill the Help Wanted section each week, and then I began to fill the pockets. In order to address the issue I’d previously had with never knowing who had taken their allowance and whose was still left in the envelope at the end of the month, I used the paperclips. Each child had a color: pink, green or purple. Their color was on their dollar for every job. If they did their job that week consistently, at the end of the week they could take their dollar out of the pocket, remove their paperclip and leave it back on the pocket for me to use the following week when I refilled the jobs. 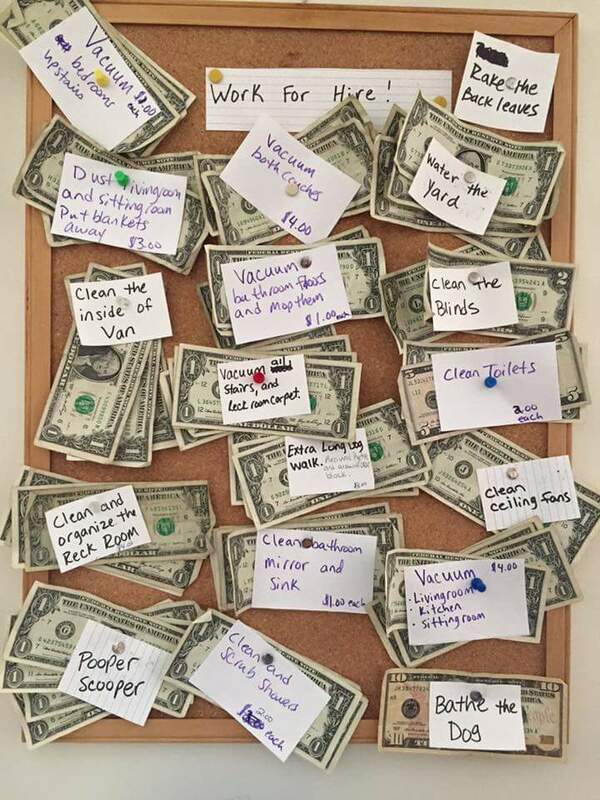 If they did one of the free money or challenge jobs that month they could also remove those dollars and leave their clips. I had worked it so that if they did a particular job that week (like dusting, vacuuming or washing windows for example) they then had to do a different one the following week so that everyone had a turn to earn a dollar doing each job once a month. This would alleviate any arguing as to who had to dust last time or who got off easy by only having to wash the dog’s nose marks off the windows and door; everyone would easily be able to see who’s clip was on the pocket and who still had options to earn an extra dollar. I’d call the first week a success! I hope that it continues on just as successfully! At the end of the first week, they couldn’t wait to take their earned money out of their pockets. Although one of the weekly jobs was putting away their baskets of laundry, only one child’s laundry had come through in the first week, so only she got her dollar, but the next two kids’ baskets will come through in the second week and they’ll get to take theirs, assuming they actually do put it away. If they don’t, the money will sit there until they do, and then they’re welcome to take it. It’s only been a week, but I love this new system. Once it is set up, it’s easy to see who has earned what, and who can take what, who can’t take a portion of their money that week, and who forgot to pay themselves. It’s easy for someone to set an earning goal and then find ways to meet that goal by doing extra work around the house, and it’s a nice feeling to know that every so often someone will willingly wash a car, wash the floor or help out with raking leaves or shoveling snow. In teaching terms, it’s easy to give no credit, partial credit, full credit and extra credit. I even have one pocket left in case I think of an extra job. Last week we had little cousins in from out of town and I knew they’d be awestruck to see a closet door full of dollars, so I put their names on a post-it note on the extra pocket, and put in a dollar for each of them to take home, as a bonus from us. As I said above, not everyone’s philosophy for allowance is the same, but for our family allowance is a vital part of learning financial literacy, and it works for us. I am hopeful that this new system will continue to motivate and reward our kids for a job well done, and I hope that it will alleviate some of the management issues we had previously. Our kids know too, if I don’t work for any reason, I don’t get paid, which means they don’t get paid either, since my job pays their allowance and all their extra-curricular activities. We talked about that at the start, and they know that if something should happen and I lose my income and they lose theirs, their weekly jobs still get done, because ultimately we are truly a team and we do all pitch in to get the jobs done. That’s what being a family is all about.